~Saturday~ Tonight I saw Mike Daisey perform his one-man show (which all of his shows are) called American Utopias, which I found extremely compelling in spite of my skepticism before going. My skepticism—and angst, truth be told—was due to Daisey's debacle of a year or so ago with regards to his show called The Agony and the Ecstasy of Steve Jobs, which was picked up by This American Life, and subsequently exposed as "theater" rather as the "journalism" that This American Life's audience assumed it was. It took Daisey a long time to cop to that fact with an apology stating that he "lost his grounding" when he "played loose with the facts in his stage monologue." Enough about the past. I'm grateful to my friends Jeff Storer and Ed Hunt, of Manbites Dog Theater, for inviting me to join them for Daisey's show this evening at the The Durham Arts Center. 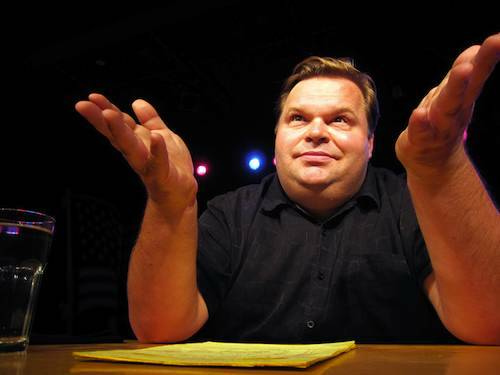 Master storyteller Mike Daisey, whose "tragic comedy and patriotic outrage . . . identify him as a direct descendant of Mark Twain" (The Stranger), offers his latest monologue American Utopias for five days in PSI Theatre. In his latest work, Daisey brings us a distinctly American vision of utopia — how people create public spaces in which they come together to act out dreams of a better world. Daisey travels everywhere to pursue the story: from Disney World and its nostalgic theme park perfection, to the drug-fueled anarchic excesses of Burning Man, to Zuccotti Park, where in the unlikeliest place the Occupy movement is born. Gunplay, raving animatronic presidents, and brutal police actions come together to paint the landscape of our American dream. Daisey does have an amazing ability to "cut through the crap" and help us see things, most of them subliminal really, that are thrown at us day in and day out, and how we have paradigms of things that we just assume are the way things really are, when in reality they are quite arbitrary. If this show comes to a city near you, I urge you to check it out. If you like theater that makes you think, you will definitely find this show compelling. "It took Daisey a long time to cop to that fact"
Since you even have the long in italics, it's worth noting that the long time you are referring to was six days after the TAL broadcast. The intensity of the coverage may have made it feel to some people like it was much longer than it actually was. Thanks for the comment. To what apology are you referring that happened on the sixth day after the TAL broadcast? Do you mean the follow-up when Ira had him back on to talk about what had happened?